Do you know your belly band from your envelope liner? 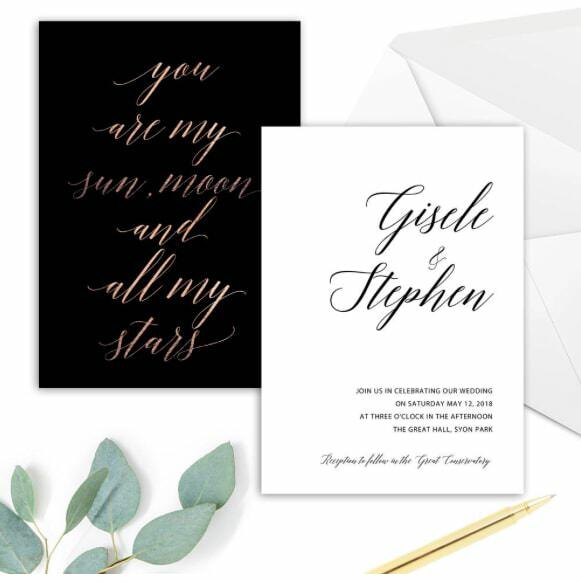 ME: Where do brides go for stationery inspiration? ND: I think understandably brides will always go to Pinterest as a first port of call, or some other online portal. They’ll get ideas from there and from magazines. But I think that if they want to include something that’s very personal to them, then they really prefer to link up with someone who can give them a bespoke service. I offer both bespoke and more off the shelf designs, which can be adapted. Quite often I get brides coming to me saying “I really love this design, but my colour scheme is… can you incorporate these colours?” In which case the answer is yes! ME: Tell me about co-ordination. 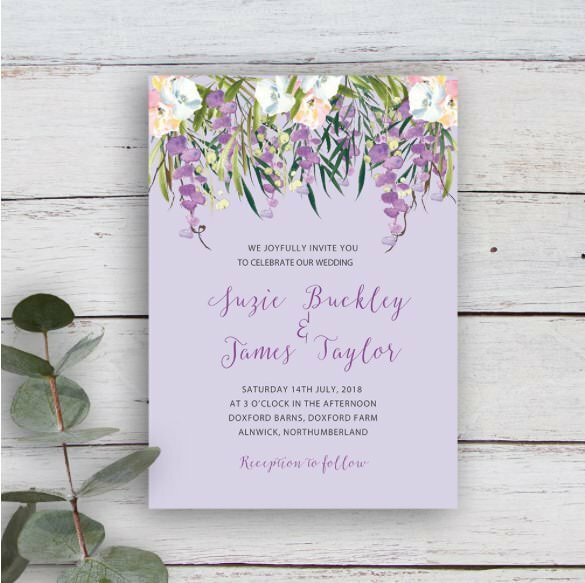 ND: Sometimes venues will provide some element of stationery, but for a more curated look or theme I offer co-ordinated stationery, everything from save the date cards to table plans. 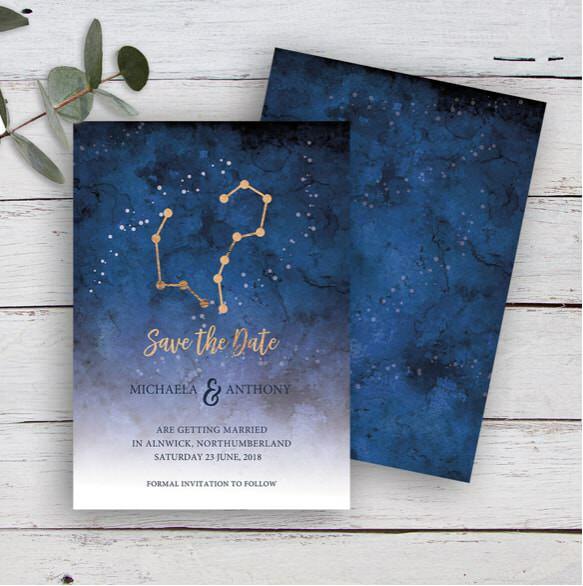 ND: Space themes; stars and galaxies are seen in both fashion and stationery. Another big theme is fantasy, with things like unicorns and mermaids because of the popularity of Game of Thrones and Lord of the Rings. And for colours it’s pastels, candy pink, green and blue. Of course with the Royal wedding coming up there might be a trend towards more regal colours, but it remains to be seen what influence that will have. Other popular trends are natural textures like marble, cork and wood – bohemian, natural luxury. Minimalist lines using bold, vibrant colours, origami/ paper craft and embroidery, ancient geometric patterns and retro holographic foils and cactus and succulents are all popular variations. 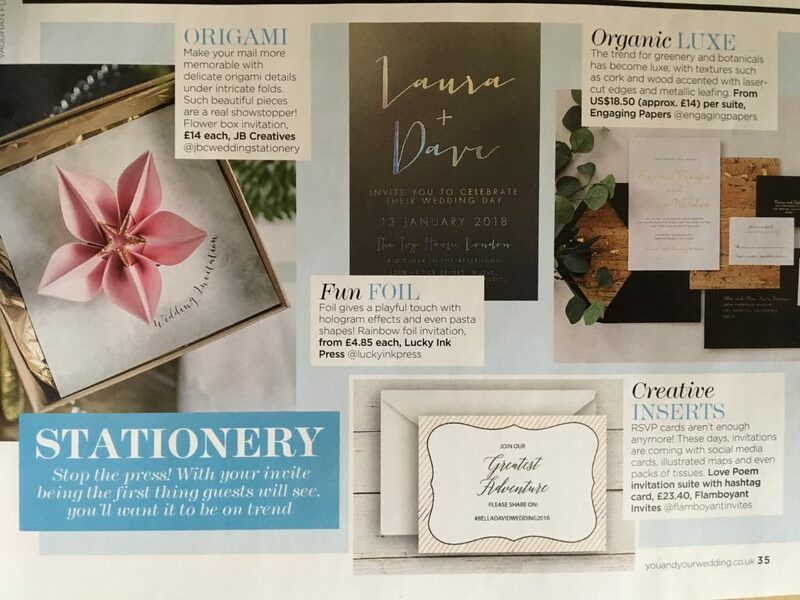 This is reflected in the 2018 trend section of Feb/March You & Your Wedding Magazine, which also features my creative insert (social media hashtag card) – see photo of the article attached. ME: What stationery is available? ND: Traditionally save the date cards are sent out up to a year in advance and these are a good way to pin people down. For the environmentally concious couple who don’t want to send out heaps and heaps of paper the wedding website is gaining in popularity. The main needs are the invitation and perhaps the details card, although the wedding website can impart all of the details of for example travel or accomodation. The RSVP is nice to have – something through the post for you to monitor who can or can’t come. Those are the key elements but in addition to these you could have envelope liners and belly bands. ND: A Belly band is a band that keeps all of your flat stationery items together. Lots of people choose to DIY this, from pretty braids or string for a more rustic look, to a paper band that co-ordinates with their stationery suite. And the envelope liner again is co-ordinated with the design, an added extra to tie everything together along with the belly band. ME: What about on the day stationery? ND: I can offer different sizes of table plan according to the need and these can be backed onto a foam board or other thicknesses depending on how it is going to be mounted. Also menus, for example this could be a little A6 size or a DL (3rd of an A3) perhaps with a personal message on it as well. Also place cards and table numbers or names. Place cards can be really fun and unusual; I recently did a square card but orientated as a diamond shape and these were mounted in air plants. ME: Who do you cater for? ND: Anyone from the DIY bride through to someone who wants the full service of printed stationery and even bespoke design.